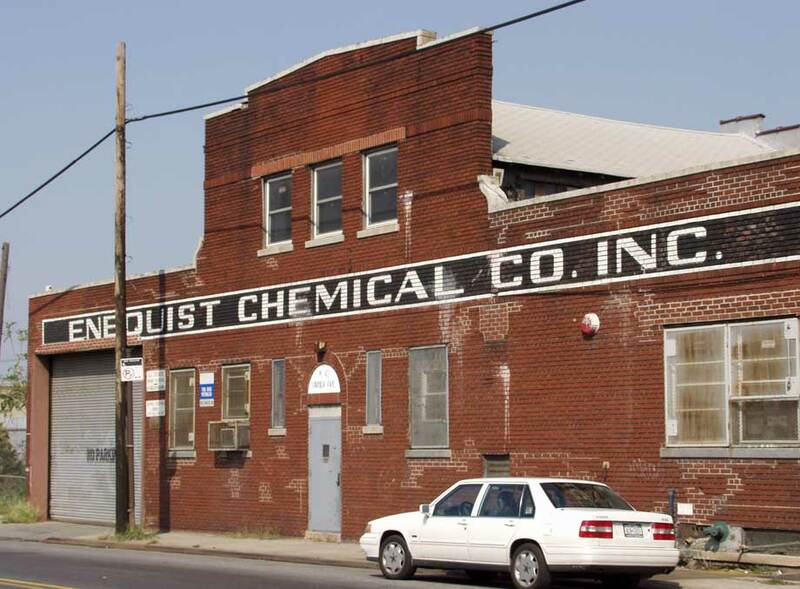 The Enequist Chemical Co. were in business in Brooklyn seventy-some years (approx. 1931 until at least 2002). They were located originally at 96 Bayard St. (1931-1933), then 255 Freeman St. (1934-1949), and moved here to Varick Ave. in 1950. Officers in Polk's Brooklyn City Directory, 1933-34, were John Enequist, Jr., and Charles Braunworth. John Theodore Enequist, Jr. (1885-1957) was the son of John T. Enequist, Sr. (1858-1933), himself a chemist who immigrated from Sweden in 1882. The family are found in the 1900 U. S. Census living at 560 Greene Ave., Brooklyn. John Enequist Sr. was 41 years old, born Sweden July 1858, a naturalized citizen, and a chemist. His son, John T. was 14 years old, born Massachusetts. The following appeared in the New York Times, 17 June 1957, "Scarsdale, N.Y., June 16 - John T. Enequist, who retired in 1955 as president of the Enequist Chemical Company, Inc. of Brooklyn, died Friday of a heart ailment after a long illness at his home in The Cragswold Apartments on Garth Road. His age was 71." Enequist's partner at Seldner & Enequist was Rudolph Seldner (1871-1930), whose obituary in the New York Times, 13 May 1930, read in part, "Rudolph Seldner, 58 years old, vice president and treasurer of the chemical firm of Seldner & Enequist, Inc., in Brooklyn, which he founded thirty-three years ago, died on Sunday in the Long Island College Hospital after a short illness. Mr. Seldner was born in Brooklyn and had been active in Jewish charitable work in the borough. ... He was educated at Adelphi Academy, where he later taught physics, and at Columbia University." Another figure at Seldner & Enequist was Edmund Eric Enequist (1892-1968). He was the younger brother of John T. Enequist, Jr., and he registered for the World War II draft in 1942, when he was president of Seldner & Enequist, 86 Hausman St., Brooklyn. Also a younger brother of John T. Enequist, Jr. was William Lars Enequist (1887-1956). He was born 12 August 1887 in Everett, Mass. He registered for the World War I draft in 1917 when he lived on Wave Crest Ave., Far Rockaway, Queens. At that time he had his own real estate business at 375 Fulton St., Brooklyn. He became president of Seldner & Enequist in 1946, when Edmund Enequist resigned. His obituary in the New York Times, 26 July 1956, read in part, "New Marlborough, Mass., July 26 - William L. Enequist of 119 Second Street, Garden City, L. I., president of Seldner & Enequist, Inc., manufacturing chemists, of Brooklyn, and a former president of the Long Island Real Estate Board, died today in Fairview Hospital, Great Barrington. His age was 68... He was elected president of Seldner & Enequist in 1946, having previously been in real estate work..."
A photograph dated ca.1920-1959 featuring a Seldner & Enequist "leakproof carrier" of some kind can be seen on the Library of Congress "pictures" site. This ad listing numerous chemicals available from Seldner & Enequist appeared in a Chemical Catalog published in 1919. The Chemical Heritage Foundation shows beautiful protraits of John Theodore Enequist and Rudolph Seldner. The Enequist photo dated ca. 1900, presumably, is John T. Enequist, Sr. In 2006 an internet blog, justinyc, reported that the building above had been demolished.